Going south through the Baltic's one next enters Latvia. All three of the Baltic States entered the European Union in 2004 so border formalities are non-existent. 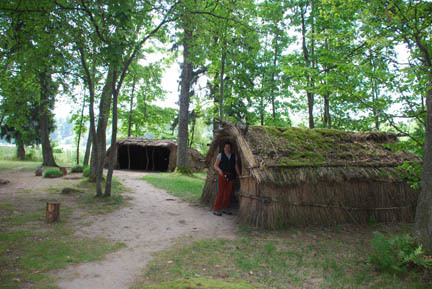 The first stop was at a re-created stone-age/iron-age village site. This was on a small peninsula in a lake that had actually been inhabited by tribes during the stone and iron ages, and during the medieval time too. The stone-age section was made up of grass and wood huts around a central fire pit. 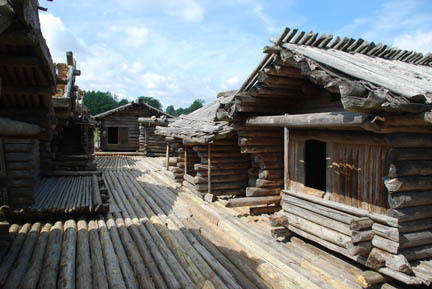 The huts had a lived-in look and we wondered if they had scout groups or others that did educational campouts here. 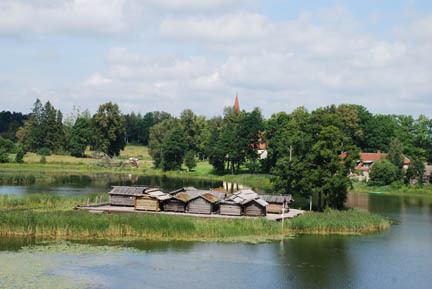 The iron-age village was built on a semi-dry island in the lake for defensive reasons. 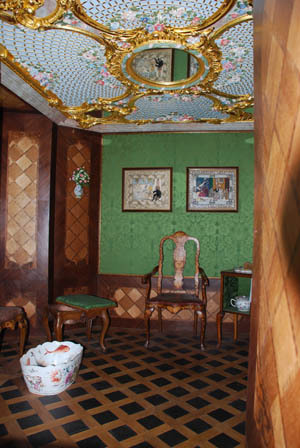 The re-creation is in the same style and pattern as the original. They have found the remains of the village in the mud and have duplicated it as close as possible. Then we rode on to the Capital city of Riga. 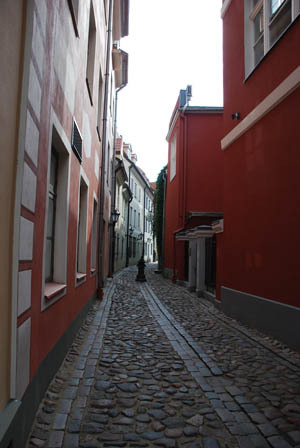 It is another city of narrow cobblestone lanes and Art Deco Buildings. Tallinn in Estonia had them too but was over run with tacky souvenir shops and bars and cafes. Tallinn is a party town for citizens of St. Petersburg and Helsinki, but Riga is not. There were some tacky shops but most had quality handicrafts of wool, amber, wood and linen. And the prices were nice too. 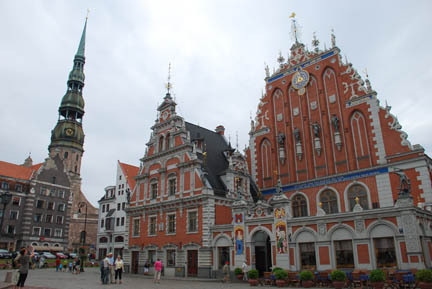 Riga was another of the "trading towns" of the 14-1600's and had guilds that built lavish halls to meet and live in and warehouses to store their goods in. The red brick building (both parts are connected) is the "Blackheads Guild". 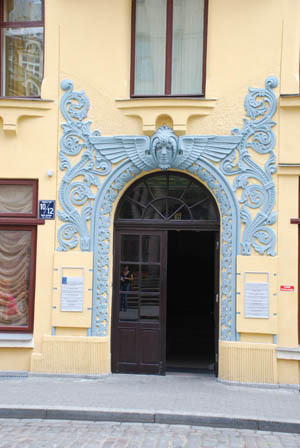 The guild is named after their patron saint "Saint Maurice", who was from north Africa. Hence the name "Blackheads". 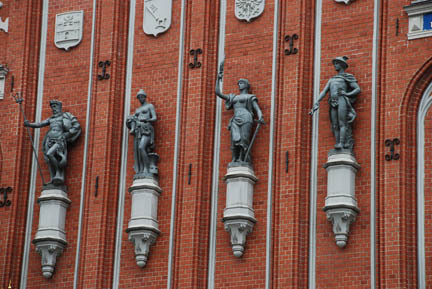 This is a close-up of the statues on the right-hand section of the building above. 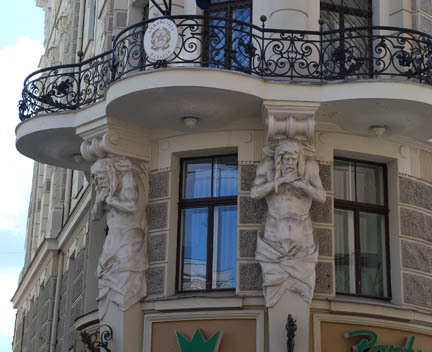 Many of the buildings in Riga have statues and three dimensional plasterwork on them. This is the Italian Embassy building. Also notice the railing on the balcony. Lots of wrought iron work in this town too. When we were ready to leave town we had to cross this bridge to get to our highway out of town. 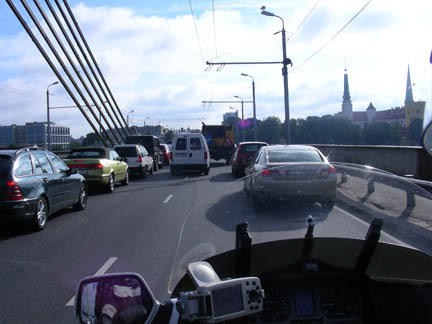 Notice that it is striped for two lanes of traffic, but notice that the vehicles are three wide. The Latvians are some of the worst drivers. On the highways they pass with on-coming traffic, forcing people over to the shoulder. If you leave a safe following distance, the guy behind you will pass you and take it. If I ride in the right tire track they pass on the left straddling the stripe, if I'm in the left tire track they crowd between me and the shoulder. They tailgate and speed. The Estonians were much better drivers, not up to German standards but much better than Latvians. On our way out of the country we stopped at Rundale Castle. 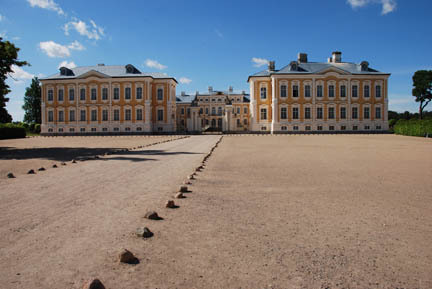 It sits out in the middle of farmland and was built in the mid-1700's by a local Duke who was friends with the Russian Tsars. 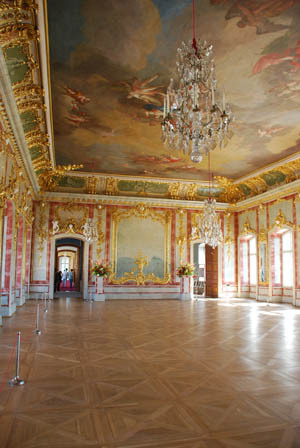 It has the usual lavish interiors with gilded ceilings and walls, frescoes and silk wallpaper. On the left is the ballroom and on the right the ladies toilet. The chamber pot is under the green seat on the left, no indoor plumbing here, the servants can empty it! Then we were in Lithuania, the last of the Baltic States.